It can be a lot of pressure can’t it, choosing the perfect tiles for your kitchen? Not only is it your cooking, and possibly eating space, if you have kids, it can be the hub of your house, constantly humming with activity as they raid the fridge and excitedly tell you about their day after school. Alternatively, it can be the special place where you entertain friends or enjoy a bottle of wine with your other half. Either way, your kitchen is a focal point in your home and understandably you want to do it justice. After spending a fortune on investing in stylish sinks, appliances and storage, the last thing you probably want to do is fork out for tiles. However, they do have a huge impact on the overall look and feel of your kitchen, as well as boasting practical sink and hob splash-back properties and being easy to clean. That’s why we’ve put together a list of 3 main factors to consider before you take the plunge and commit to a specific kitchen tile design. Master the Rainbow. With so many colours and designs out there, it can be hard to know where to begin. He also notes that blue and white make a winning fusion where colours are concerned. “They’re such a classic combination – and they have a particularly fresh feel that’s perfect for kitchens,” he adds. You can’t go wrong with light colours, as they can make even the smallest of kitchens look more spacious. Tile in your style. It’s not every day you give your kitchen a complete make-over so why not be daring and adventurous? Choosing a striking focal point as a design will ensure your kitchen radiates the ‘wow factor’. You may be more inclined towards a subtle look that diversifies your tile design by using borders to break the wall up. If potential future buyers for your home being put off is a worry for you, avoid ‘busy’ designs that will overwhelm a kitchen and patterned floors and walls as these can clash. A good solution might be to use a border comprising tiles of the same design as the floor to compliment the groundwork tiles. If you’re still weary of scaring potential buyers but can’t get a particularly bold and remarkable design that you have fallen head over heels for out of your mind, consider using it to tile only splashback areas around your hob and sink so it’s not as powerful but still reflects your tastes. Remember if your design needs a lot of tile cuts, around fixtures, for example, opting for small tiles to provide a better pattern flow is a handy idea. Go the Extra Mile. Tiles are meant to last, (ours are designed to last over 25 years) so don’t skimp on cost if you don’t have to. You’ll also benefit from buying an extra 5-10% more tiles than you actually require. This means you are guaranteed the same batch/shade or design if some tiles should break and you need more. 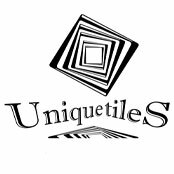 In the rare event of tiles breaking in transit, if you keep the damaged tile and packaging, and simply email us, our team to send you a new tile at our expense.If you’re tiling your kitchen floor, do your homework and check the floor tile rating (PEI Rating) to ensure it’s safe for your intended use. Invest in quality and be unique! Above all the best advice we can give you is to ask for advice! If you have any questions about the tiling process, contact our team who will be happy to help you.